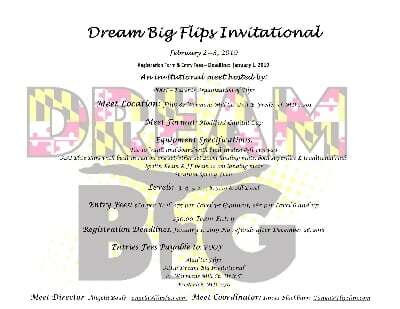 Flips, Gymnastics Specialists of Frederick, MD Welcomes You to Our Special Programs & Events! Flips is delighted to offer special programs to augment our regular curriculum. Come and Celebrate Your Special Day! Our typical Birthday Party last 1 hour and 30 minutes. This gives our birthday guests an hour fun on the floor and 30 minutes of table time. During the Flips Play Time your child will enjoy age appropriate, games, gymnastics, obstacle courses, moon bounce and open gym. A deposit of $50 is required to book your party. Party times may vary from Saturday afternoons to Sundays. You Provide the Favors, We Provide the Fun! Flips is excited to offer field trips for childcare programs and youth groups of all ages. Children will enjoy 45 minutes of age-appropriate gymnastics instruction and/or team-building activities with our trained coaches, followed by 45 minutes of open play. This is a great opportunity for scouts, church youth groups, daycare groups and more! Please Call Us for more details and to discuss rates and availability. Schedule your special gymnastics outing today! Girls' Night Out Parties at Flips! Ladies - get your friends together for a fun fit time. Enjoy an hour of gymnastics followed by some BYOB Girl Time. Or, get you other half in on the fun for a great group date night event. Give Us a Call for more information on about these private party opportunities. You Need a Night Out! Parents' Night Out is a great way for you to catch a movie or go out to dinner. Flips will take care of the kids for the evening. One or two Friday nights a month we will provide the coaches to watch over your little ones while they do open gym, watch a movie, have a snack, do a craft, and play with their friends. Private lessons at Flips are by appointment only. Please Call Us to schedule a private gymnastics lesson. Flips Sleepovers offer your gymnast (ages 5+) food, friends, and gymnastics fun galore! These are hosted periodically by Flips throughout the year. Dropoff is typically 5:30 PM on a Saturday with a Sunday pickup at 9:00 AM. We provide dinner, fun, breakfast, and of course Gymnastics! Please Call Please call or stop by to reserve your child's spot. Flips is proud to offer opportunities to participate in special (annual) events. Flips is a sanctioned facility for USAG competitive events. Scoring system is through Beyond the Scores. What a great time to get invaluable help on drills, skills and execution errors. There will be judges and high level coaches posted at each event ready to assist gymnasts and coaches as the gymnasts work on each apparatus. 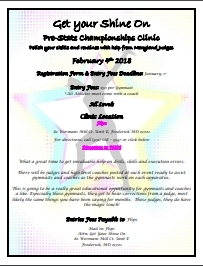 This is going to be a really great educational opportunity for gymnasts and coaches alike. Especially those gymnasts! Hearing corrections from judges will be invaluable. Those judges, they do have the magic touch! At Flips we host two Exhibition Competitions a year for all of our class students ages 5 and older. These events are 100% recreational for our students only. An exhibition competition is a gymnastics style competition where each child demonstrates specific skills in order as a routine on each apparatus (vault, bars, beam and floor). Each child is then scored on each event by some of the Flips gymnasts on the competitive team, much like a real competition. All gymnasts are winners at this event. They are broken into very small age groups and levels. Each participant receives a medal on each apparatus, and also receives a trophy for their total score on all apparatuses. This is a great opportunity to see your child in action in a real competition setting; there is also enough space for friends and family to come to this event as well. Please remember that there is admission to this event. All proceeds made the day of the event go directly to the competitive team gymnasts. Come celebrate with Flips at the Children's Festival at Baker Park on April 28th. We will be there all day with an obstacle set up for our little friends to tumble, jump, and play. Come and watch the Flips competitive gymnasts as they demonstrate all of their routines on all the apparatuses. This is a very fast event so don’t be late or you’ll miss out on the action. Come Celebrate with Flips as we Flip our way through Frederick’s In The Streets at the Sports Block. In the morning there will be a small obstacle set up for our little friends to tumble, jump and play. In the afternoon you will see action from all of our Flips Competitive Team Members as they demonstrate their tumbling skills. Then at 12:30pm and 2:30pm, all of our Flips team members will be doing a Flip-a-thon to help raise funds for their uniforms. Saturday, September 22nd Join us and everyone around the world at 1:00 as we kick up into a handstand and celebrate National Gymnastics Day! Spooky spiders & games galore, Treats will be plenty, With much fun in store. So put on a costume, and fly on in; We’re so excited for the fun to begin, the witches are preparing with a special brew, the goblins are gathering with pizzas & pies. The scarecrows are bringing pounds of candy from near and far. We only ask that you come prepared with a ticket, and a broom! So come on in, get your ticket today and let the spooking begin. Come in your costume for the Flips Costume Contest.